We’ve been having a lot of fun with it lately but there seems to be a legitimate concerted effort to resurrect the mid-aughts musically, with a handful of groups that gained prominence during the early metalcore and deathcore explosions coming back after multi-year hiatuses and breakups, deciding that 2018 was going to be the time they all returned. They’re obviously not the only bands to do so this year, but it sure does seem like 2018 has been designated the year of the comeback. We have to be on something of a ten-year cycle for groups breaking up and re-uniting, because that is one of the few ways I can explain how so many bands who were content to hang it up about seven-to-ten years ago all came back at once. If you’ll allow us to pull the curtains back a bit, it seems like my recent review work slate consists entirely of groups returning from my first few years of community college – – particularly the three-pack of Bleeding Through, The Agony Scene, and Light This City, although Into Eternity coming back and local Sacramento groups Journal and Jack Ketch both also joining the fray are part of the phenomenon, with the last two admittedly a likely the reason I’m pounding away at this theme. As mentioned, Light This City are one of these groups, calling it quits after the release of their 2008 album Stormchaser and from then on reuniting sporadically only for a small handful of live dates (coincidentally the only times I had seen them up until July 1st of this year) — until this year, which saw the late-May release of the group’s newest album through Creator-Destructor Records, Terminal Bloom. It’s a well-worn cliché to day it, but Terminal Bloom picks up right where the band last left off with their previous album Stormchaser. 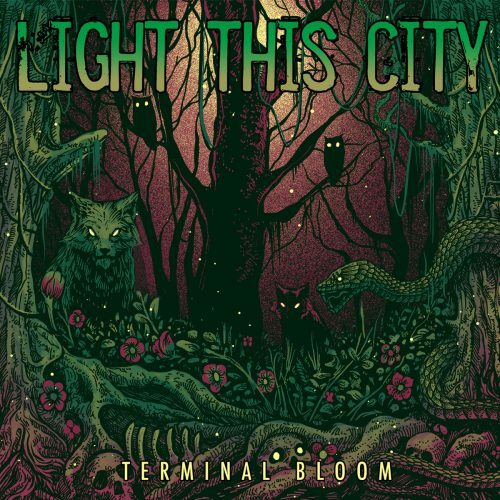 If you were unaware of the gap of time between discs and had taken in Light This City’s discography in one bulk go, Terminal Bloom would feel like the next natural step from the band’s near-complete transformation into a melodeath group on that previous disc. You wouldn’t even realize that other bands had been founded in that gap of time — and the Light This City crew definitely kept busy on that front — because from the moment that Terminal Bloom kicks into high gear it is like Light This City never left. 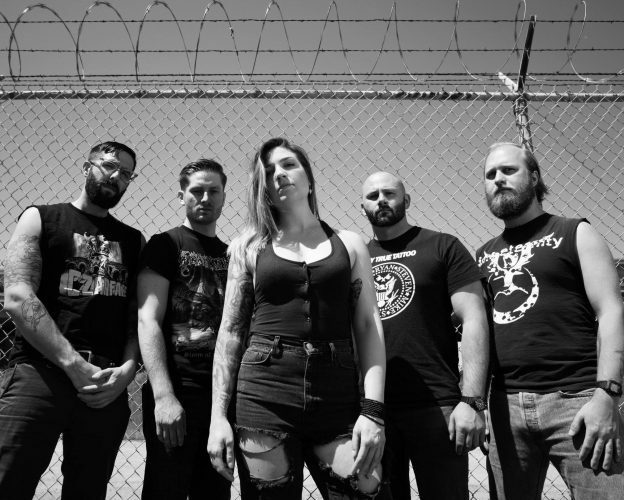 Not only that, but Terminal Bloom has the band performing the act of adapting themselves to the current metal scene as well as maintaining all the specific sounds that made these Bay Area dwellers what they were known for to begin with. Thus, you wind up with Terminal Bloom maintaining a mostly non-stop and relentless barrage of delicious guitar work and songwriting that pulls from all of Light This City’s blueprints — plenty of full-blown high-speed blast segments, a ton of melodeath two-step riffs, and a helping of guitar solos that sound like they could’ve been torn straight out of the thrash scene. The ferocity levels on Terminal Bloom start high and remain there for much of the album’s run-time with nary a break — “Death Downwind” being the album’s sole peaceful instrumental. Rarer still is the occasional mid-tempo track amongst the ten songs present. In fact, “A Grotesque Reflection” is one of the few times on Terminal Bloom that makes use of a slower, stomping riff as an opening driver, which sounds like the band overdosing on mid-era In Flames for a bit. The rest of the disc has a ton of ridiculously fast gallops and driving blastbeats to make sure that nothing ever slows down, with songs like “Dormant Tide” and “The Wake Of My Will” at times sounding like alternate-world reflections of each other. “Extinguished”, with its shorter run-time, proves to be something of a highlight, if not just for its angular opening bit that smoothly moves into a fun and punchy verse, but is mostly driven by a violent and surging death metal segment that continually worms its way throughout the entire song. “Neverlanding” — which falls into Terminal Bloom’s back few songs, also proves to be a lot of fun if you’re a fan of rotating between a non-stop “one-two, one-two, one-two” beating for three minutes straight. Terminal Bloom almost weaponizes its pace throughout its half-hour listening session. Terminal Bloom does have a couple of interesting quirks outside of the aforementioned relentless pace and songwriting style; with the pace that the album keeps, Terminal Bloom goes by shockingly fast. It clocks in at a scant few minutes over a half hour, tying the event up into a fairly neat package. It suffers from no bloat whatsoever and that suggests that this album has really been honed in on, trimmed down, and chiseled into the form that it takes today. Even with a fairly beefy ten-song tracklist, Terminal Bloom will often have listeners looping back around into the soft opening acoustic notes of “Reality In Disarray” before they even notice it. Coupled with the fact that the sound of Terminal Bloom is also stunningly clear — something of a trait with Light This City, as earlier albums could almost be defined by a remarkably clear snare + cymbal combo that often came ringing through the mix whenever drummer Ben Murray elected to start blasting his way through songs — the compact length leads to Terminal Bloom feeling like a well-polished half-hour slab of thrashier melo-death crashing headlong into the band’s light -core elements. The previously mentioned guitar solos especially are brought to the forefront quite often, with a ton of near-Slayer level note-bending that has the guitar screaming on the way into the next riff. The ongoing questions with many of these bands that are coming back from extended time off usually boil down to two main components, often based around the overall effect on their subculture that a new album can have. It’s always the old chestnuts of “what does such-and-such band even sound like now”, which usually includes a ton of sub-discussions and pontifications about whether the band will sound like a modern group or if they’ll just be doing a throwback disc, since rarely do comeback albums exist in any sort of vacuum. The second one is usually “what does ‘blank’ album represent for this group”. Both are interesting situations for Light This City. Their overall status in the metal world always had them existing as a well-known yet still fairly underground band, which in the long run meant the band changed more than one might’ve expected over the course of their career. By the time Stormchaser came out the band had done what many in the -core scene seemed to be doing, becoming an almost full melodeath band, full of galloping guitar and with many a Gothenburg two-step riff to be heard. It also meant that Terminal Bloom really gave them some freedom to just be mean-as-hell, which they manage to do with reckless abandon. Vocalist Laura Nichol is right at forefront with a near-fiery delivery for much of Terminal Bloom, launching solid punches to help amplify key moments throughout the whole disc. And Terminal Bloom‘s thrashier side-step slots in perfectly alongside the group’s melodeath and -core roots, which gives the album an unbridled energy that can make listening sessions a rush. It is a loud, fast, and mean album that carries just a tiny-bit of grit on its otherwise beautifully sleek sound, and is a great way for Light This City to return back to the fold. GODDAMMIT I LOVE THIS. ITS LIKE TOUCHE AMORE EXCEPT DEATHY.